Tomatillos grow really well around here. I’m guessing they probably grow really well anywhere, since northeast Ohio isn’t really prime tomatillo climate and they still go crazy in these parts. And they reseed really, really easily. They’re practically weeds. Just saying, if you’re thinking about growing them sometime. I planted four last year and found out the hard way how wild they become. I planted two this year (and switched to a purple variety). But I was also inundated with many hundreds of volunteers, so I ended up with four again. Since they produce prolifically, and I don’t know of very many ways to use tomatillos (though this chili is good), I just make lots of salsa verde (“green sauce”). 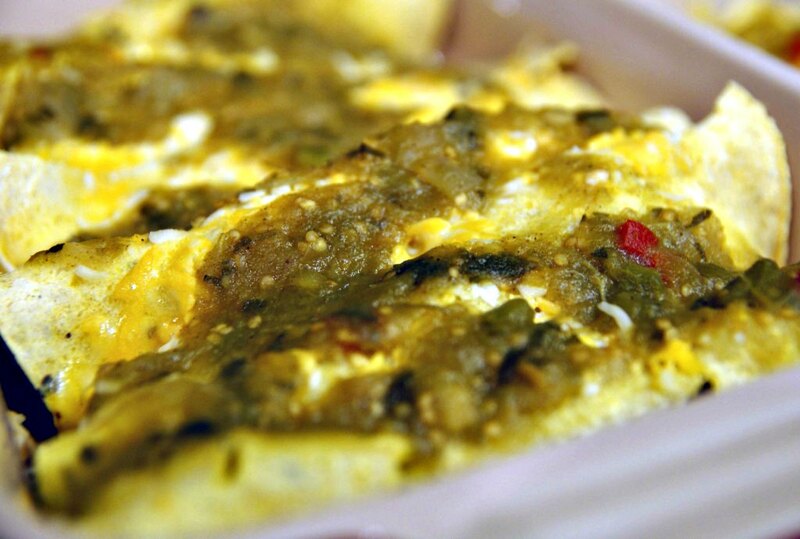 Tangier than your standard tomato salsa, salsa verde is commonly used in enchiladas or just for straight-up dipping, but it’s versatile enough to adapt to a number of situations (I like to put some on my eggs as an occasional change of pace). It’s easy to whip up, and this recipe can be used fresh, frozen, or canned for later use. Roasting is not necessary, so you can skip it, but it does add a little different flavor to the end result. You’ll need tomatillos, onion, garlic, a hot (or not) pepper or two of your choosing, lime juice, a little fresh cilantro, some salt, and maybe some cumin. 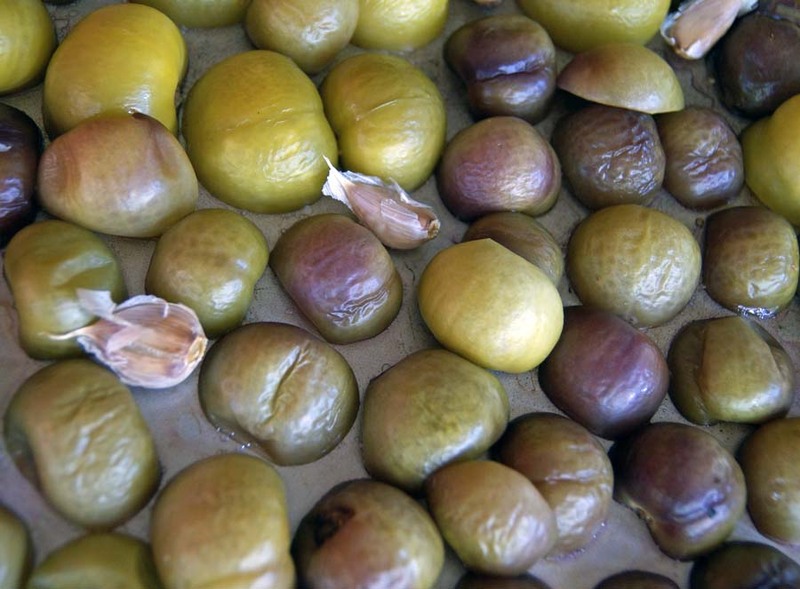 Remove the husks from the tomatillos and give them a good rinse. Cut them in half and place them, along with a few clove of garlic (unpeeled), onto a rimmed baking sheet (rimmed is important, because they’ll release a lot of juice, and you don’t want that to end up on the bottom of your oven). Pop this into a 400 F oven and roast for about 20 minutes, or until they’re soft and just starting to brown on top. Dump the tomatillos into a Dutch oven, peel the garlic and add it, and toss in the onion and peppers too. Bring to a simmer and cook until the onions are translucent. Add everything else, then give it a good churning with your immersion blender (or dump the contents into a regular blender). Once smooth, it’s done, and you can eat it now or freeze and can it for later (process pints 10 minutes in boiling water)! 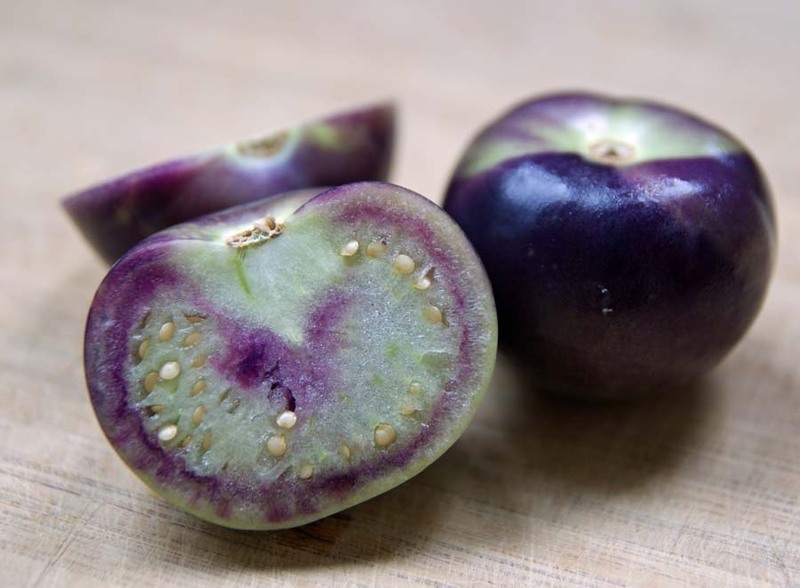 Remove husks from the tomatillos, rinse, and cut in half. Place onto a rimmed baking sheet, along with the garlic. Bake at 400 F for 20 minutes, or until soft and just starting to brown. Dump the tomatillos and garlic (peel it first) into a Dutch oven. Add the rest of the ingredients and bring to a simmer. Simmer until onions are translucent, then using an immersion blender, puree until smooth. Taste and add any additional seasoning. If canning, process pints for 10 minutes in boiling water. 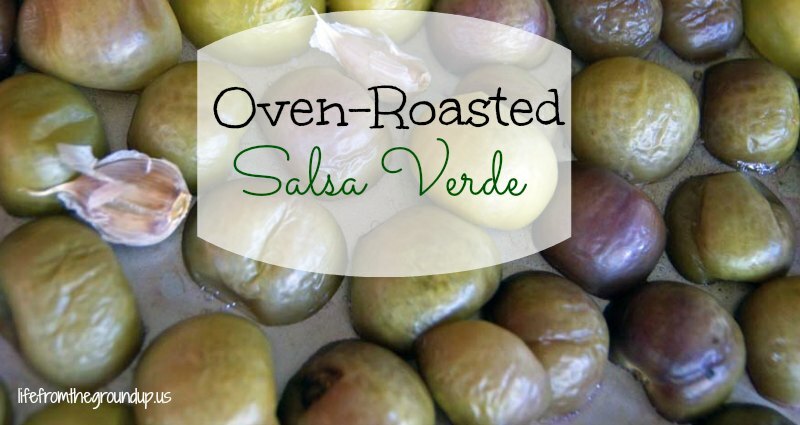 Cook a pound of ground beef, then add 1/2 pint of salsa verde. Spoon the beef mixture into tortilla shells, then roll them up and place seam-side down in a small baking dish. When the dish is full, drizzle the rest of the salsa verde over the enchiladas and top everything with shredded cheese. Bake at 350 F for 15 minutes or until the cheese melts. Super simple and super good.